Fifteen years after its licensure, this revision assesses the role of cefditoren facing the current pharmacoepidemiology of resistances in respiratory human-adapted pathogens (Streptococcus pneumoniae, Streptococcus pyogenes, Haemophilus influenzae and Moraxella catarrhalis). In the era of post- pneumococcal conjugate vaccines and in an environment of increasing diffusion of the ftsI gene among H. influenzae isolates, published studies on the cefditoren in vitro microbiological activity, pharmacokinetic/pharmcodynamic (PK/PD) activity and clinical efficacy are reviewed. Based on published data, an overall analysis is performed for PK/PD susceptibility interpretation. Further translation of PK/PD data into clinical/microbiological outcomes obtained in clinical trials carried out in the respiratory indications approved for cefditoren in adults (tonsillitis, sinusitis, acute exacerbation of chronic bronchitis and community-acquired pneumonia) is commented. Finally, the role of cefditoren within the current antibiotic armamentarium for the treatment of community respiratory tract infections in adults is discussed based on the revised information on its intrinsic activity, pharmacodynamic adequacy and clinical/bacteriological efficacy. Cefditoren remains an option to be taken into account when selecting an oral antibiotic for the empirical treatment of respiratory infections in the community caused by human-adapted pathogens, even when considering changes in the pharmacoepidemiology of resistances over the last two decades. The review of the high number of pharmacodynamic studies carried out with cefditoren since its licensure shows that cefditoren maintains its pharmacodynamic activity against the most prevalent bacterial isolates from community respiratory infections. Among the complex niche representing the nasopharyngeal microbiota, four bacterial species have in common humans as exclusive commensals, with no animal or environmental reservoirs contributing to their life-cycle: Streptococcus pneumoniae, Streptococcus pyogenes, Haemophilus influenzae and Moraxella catarrhalis, with different turnover rates in nasopharynx. Human to human transmission, which occurs via respiratory droplets, is critical for them to persist. Alterations in the ecological niche or migrations to other niches are responsible for their change to human-adapted pathogens causing pharyngotonsillitis (S. pyogenes) or otitis, rhinosinusitis and lower respiratory tract infections (LRTIs) (S. pneumoniae, H. influenzae and M. catarrhalis). Thus, apart from their commensalism, they exhibit direct pathogenicity. Additionally, the indirect pathogenicity of H. influenzae and M. catarrhalis protecting S. pyogenes and S. pneumoniae from the action of some β-lactam antibiotics by means of their β-lactamases has been described. In vivo, formation of biofilms (which are larger when S. pneumoniae and H. influenzae or M. catarrhalis are present than when only one species is alone)  favors indirect pathogenicity and intracellular antibiotic deactivation . The coexistence of susceptible and resistant cells within these bacterial communities increases the opportunity for horizontal gene transfer during antibiotic selection pressure . This gene transfer depends on the duration of carriage: strains with longer duration of carriage have a greater risk of antibiotic exposure and thus, greater risk for acquiring resistance . In turn, resistance implies fitness advantages for bacteria in the presence of antibiotics, favoring spread of resistant isolates within the community. Antibiotic resistance significantly impacts on patient’s illness burden in the community, and patients with laboratory-confirmed antibiotic-resistant respiratory tract infections (RTIs) are likely to experience delayed recovery following antibiotic treatment . In the era prior to licensure of conjugate pneumococcal vaccines (PCV), antibiotic use was the basic and exclusive force behind resistance patterns in bacteria isolated from community-acquired infections [5–7] despite of descriptions of correlations between pneumococcal resistance and educational level, climate and proportion of young people in the population . At different geographical areas, positive correlations between percentages of macrolide resistance in S. pneumoniae and S. pyogenes were described , and resistance was associated with macrolide consumption (mainly compounds exhibiting long half-life) [7, 9, 10]. Similarly, β-lactam consumption (mainly oral 2nd generation cephalosporins) was associated with penicillin resistance in S. pneumoniae . A global ecological relationship of resistance between penicillin-resistant S. pneumoniae, erythromycin-resistant S. pneumoniae, erythromycin-resistant S. pyogenes and ampicillin-resistant H. influenzae was described , reinforcing the idea of consumption of certain antibiotics as driver of resistances in human-adapted respiratory pathogens in the community. In the post-vaccine era, this situation has completely changed with a decrease in the prevalence of penicillin-resistant S. pneumoniae (with lower changes in erythromycin resistance in both streptococcal species) and the emergence of ampicillin-resistant phenotypes not related to β-lactamase production in H. influenzae. These complex dynamics have been influenced by different factors in the present century: vaccine pressure and natural serotypes fluctuations, co-selection of resistances, selection of co-resistances, and antibiotic consumption patterns according to the population structure , among others. Figure 1 shows the steps analyzed in this extensive revision. Although they have in common being human-adapted pathogens colonizing the nasopharynx as their natural ecological niche, not all of them have equally responded (on the basis of non-susceptibility emergence and dissemination) to the preventive and therapeutic measures introduced. Spread of resistance in S. pyogenes and M. catarrhalis, limited to certain antibiotics, contrasts with emergence and spread of resistance to β-lactams and macrolides in S. pneumoniae and H. influenzae, driving to more complex scenarios. S. pyogenes is uniformly susceptible to β-lactams and, among oral cephalosporins, cefditoren exhibits the highest intrinsic activity, with MIC90 values ≤0.06 mg/l. [13–15] Resistance to erythromycin (implying resistance to clarithromycin and azithromycin) varies from < 10% (USA, Baltic countries, Romania), to 10–20% (Poland, Czech Republic, Spain) and 25–35% (Slovakia, Hungary, Hong Kong), being up to 93.5% in China [13, 16–20]. Almost 100% strains of M. catarrhalis are β-lactamase producers ; MIC90 values of cefditoren (range from 0.25 to 0.5 mg/l) are lower than those of amoxicillin/clavulanic acid (range from 0.25 to 2 mg/l) and cefuroxime (range from 2 to 8 mg/l [14, 15, 22, 23]. Based on the most common pediatric serotypes, PCV7 was developed and introduced for universal immunization of healthy children in most developed countries in 2000–1. However, detection of emerging new serotypes in the late PCV7 period led to the inclusion of six additional serotypes in the new PCV13 in 2010. Since then, decreases in invasive pneumococcal disease (IPD), not only in children but also in adults due to herd effect [24–27], as well as in PCV13 serotypes involved in non-invasive diseases, have been described [25, 27]. Although some studies [28–30], but not others [24, 31], have found slight increases in non-PCV13 serotypes causing IPD, individually none of the non-PCV13 serotypes has shown a significant increase , in contrast to the increase in serotype 19A (with its associated resistant sequence types ) after PCV7 implementation [33–35]. Since susceptibility is strongly linked to serotypes, targeting prevalent capsular serotypes with PCVs is extremely effective in reducing resistant infections . While in countries that lack a significant PCV coverage > 40% isolates are penicillin-resistant , in those where PCV13 was introduced, antibiotic–nonsusceptible IPD has decreased in all age groups [24, 25, 37], as well as antibiotic–nonsusceptible isolates colonizing the nasopharynx in children . Data from 2013 in USA showed that the proportions of non-susceptible IPD cases were around 10% for penicillin and 33% for macrolides in children, and around 6 and 28%, respectively, in adults . These high nonsusceptibility rates to macrolides in USA are lower than those found in a surveillance from 11 Asian countries reporting a mean percentage of resistance to erythromycin as high as 72.7%, with the highest rates in China (96.4%), Taiwan (84.9%) and Vietnam (80.7%) . Another report from Thailand confirmed high resistance rates to erythromycin (51.3%)  in Asia. The highest activity of cefditoren was also demonstrated in an in vitro study comparing cidal activity of serum achievable concentrations of third-generation oral cephalosporins (cefditoren, cefpodoxime, cefdinir, and cefixime), using cefotaxime as control drug, against pneumococcal strains distributed by cefotaxime MICs (0.5 to 2 mg/l) . Against strains with cefotaxime MIC > 1 mg/l, only cefditoren (at 0.5–1 mg/l concentrations, which are lower than the maximum concentration in serum) achieved > 90% reduction of initial inocula . Another study comparing cidal activity of cefditoren with that of other β-lactams (amoxicillin/clavulanic acid, cefuroxime, cefixime and cefpodoxime) and levofloxacin showed that cefditoren was the only agent achieving, at concentrations equal to 2× MIC, significant bactericidal activity (≥3 log reduction of initial inocula within 4 h) against penicillin- susceptible and resistant S. pneumoniae . These studies, carried out in the pre-PCV13 era, demonstrated the high comparative intrinsic activity (in terms of MIC and bactericidal activity) of cefditoren against S. pneumoniae. In the post-PCV13 era, considering that, as stated, the vaccine implementation has reduced the prevalence of pneumococcal resistance in the community [24, 25, 36–38] by targeting most resistant serotypes, the number of penicillin-resistant isolates with high cefditoren MICs (i.e > 0.25 mg/l) should had necessarily been reduced. Traditionally, β-lactamase production was the mechanism of resistance to aminopenicillins in non-typeable H. influenzae (NTHi). However, antibiotic pressure by amoxicillin/clavulanate and oral cephalosporins contributed to the spread of non-enzymatic resistance mechanisms linked to the ftsI gene . In the past decade, many countries experimented a rapid increase in genetically-defined β-lactamase negative ampicillin-resistant (gBLNAR) isolates, accounting for 15–30% of all isolates, among others, in Europe, Australia and USA, with up to 50% in Japan [54–59]. In Spain BLNAR isolates increased in parallel with decreases in β-lactamase producing-isolates , and the last published study determining susceptibility of invasive H. influenzae isolates showed up to 19% gBLNAR isolates compared with 16.9% isolates resistant due to β-lactamase production . Similarly, a recent report from Japan showed the lower percentage of ampicillin-resistant strains due to β-lactamase production (5.6%) than to BLNAR (37.2%) among NTHi respiratory isolates . In Sweden, the increase in β-lactam resistance among invasive H. influenzae isolates has also been attributed to the significant increase in BLNAR isolates . Isolates exhibiting both mechanisms of resistance (β-lactamase production and mutations in the ftsI gene), the so-called β-lactamase positive amoxicillin/clavulanic acid-resistant (BLPACR) isolates, account for lower proportions than BLNAR isolates [16, 58, 60], also among invasive isolates , generally with percentages lower than 5%. However, higher and overtime constant rates of BLPACR isolates  and marked increases from 2011 to 2013, reaching 19% in China , have been reported. Published data show that both against β-lactamase positive and negative NTHi isolates, MIC90 values of cefditoren (range from ≤0.03 to 0.06 mg/l) are 5–7 dilutions lower than those of amoxicillin/clavulanic acid or cefuroxime (MIC90 range from 1 to 8 mg/l for both compounds) [14, 15, 22, 41, 44]. PBP3 modifications subsequent to ftsI gene mutations could decrease susceptibility not only to aminopenicillins but also to some oral cephalosporins as cefaclor or cefuroxime [60, 61, 64]. Against BLNAR isolates MIC90 values were 0.03–0.06 mg/l for cefditoren; values markedly lower than those for amoxicillin/clavulanic acid (4 mg/l) and for cefuroxime (2–16 mg/l) [14, 15, 65]. Recent reports have confirmed the high intrinsic activity of cefditoren against NTHi independently of the production of β-lactamase or the BLNAR phenotype [66, 67] or the presence of both resistance mechanisms . On the other hand, NTHi can be considered intrinsically resistant to macrolides, being its resistance associated with the presence of efflux pumps in virtually all strains . Table 1 resumes the comparative intrinsic activity of cefditoren in terms of MIC50/MIC90 values obtained in the different studies. Fortunately, cefditoren is a drug with high number of pharmacodynamic studies published in the literature. Pharmacodynamics constitute one of the major basis for setting breakpoints by Regulatory Agencies . For this reason, and since there are not established CLSI or EUCAST breakpoints for cefditoren to guide interpretation of susceptibility data, for clinical decision making, the analysis of published pharmacodynamic data is essential to delimit susceptibility. Table 2 shows a summary of the PK/PD studies performed with cefditoren [73–85]. Most of the studies carried out against S. pneumoniae included isolates exhibiting a wide range of cefditoren MIC values (from 0.125 to 4 mg/l). For PK/PD interpretation, these pneumococcal studies acquire relevance because in the studies carried out with H. influenzae or S. pyogenes it was not possible to test the wide range of MIC values required for evaluation, due to the very high intrinsic activity of cefditoren against both species, as has been commented. Importantly, some of the pharmacodynamic studies addressed the high protein binding rate of cefditoren, which is ≈88% . Through the addition of human serum or albumin in the tubes/devices used in in vitro tests [73–75] or animal models in mice (where the experimentally measured protein binding rate, 87%, was similar to the rate in humans) , pharmacodynamics were determined in more realistic situations than using extrapolated free drug concentrations. The activity of cefditoren should not be linked exclusively with the theoretical unbound fraction extrapolated from the plasma concentration. The presence of 90% human serum did not limit bactericidal activity as did the use of concentrations similar to free-drug. The experimental bactericidal activity of cefditoren (both total and free concentrations) was maintained over the dosing interval regardless of the presence of mutation in the ftsI gene or β-lactamase production, in contrast to co-amoxiclav. Bactericidal activity at 12 and 24 h was obtained against all strains with cefditoren, but not with comparators. Cefditoren exhibited the highest bactericidal activity maintained over time against ampicillin-resistant H. influenzae, regardless of beta-lactamase production and/or BLNAR phenotype. Cefditoren offered higher antibacterial effect than comparators due to its higher activity against beta-lactamase-producing strains and those carrying ftsI gene mutations. BLNAR and BLPACR strains were selected by cefuroxime and co-amoxiclav, respectively. Cefditoren (but not comparators) completely countered indirect pathogenicity and eradicated S. pyogenes and both H. influenzae strains. One remarkable fact of cefditoren pharmacokinetics is the different bioavailability in the fast/fed states. The administration of cefditoren-pivoxil following a high fat meal results in a 70% increase in mean AUC and 50% increase in mean Cmax compared to administration of cefditoren-pivoxil in the fasted state . Therefore, conclusions of pharmacodynamic studies are different depending on the fed/fast condition of subjects included [85, 88], and for this reason the prescribing information recommends cefditoren intake with meals to enhance absorption . Essential points guiding susceptibility interpretation are the accepted cut-off values of the PK/PD index predicting efficacy for β-lactams (percentage of dosing interval that antibiotic concentrations exceed the MIC; t > MIC), set at 40% for clinical cure and at 33% for bacteriostasis [89, 90]. The FDA and CLSI definitions of the “susceptible” category involve the bacteriostatic endpoint (33% t > MIC) since “susceptibility” is defined as the likely inhibition of the pathogen if the antimicrobial compound reaches the concentration usually achievable after administration of the recommended dose [91, 92]. Several susceptibility breakpoints have been proposed for cefditoren [93–95], ranging from ≤0.125 mg/l (included in the FDA prescribing information)  to ≤0.5 mg/l (approved by the Reference Member State, Spain, during the Mutual Recognition Procedure in Europe) . In vivo, a pneumococcal sepsis model infecting mice with isolates exhibiting exceptionally high MICs of cefditoren (1–2 mg/l) exceeding the proposed susceptibility breakpoints, showed that cefditoren t > MIC of ≈35% (free t > MIC of ≈20%) produced 100% survival compared with 0% survival in untreated animals . A free t > MIC value of ≈20% was also related to > 99.9% reduction in bacterial load of two different pneumococcal isolates (MICs of 0.25 μg/ml) in an in vitro pharmacodynamic simulation with physiological albumin concentrations and 86% protein binding rate in the device . These two studies demonstrated that the limitation of the activity of cefditoren by protein binding is far from absolute, being the activity of total concentrations in the presence of albumin/serum higher than the one exhibited by calculated free concentrations. The range of proposed breakpoints (from ≤0.125 to ≤0.5 mg/l) is well supported by a Monte Carlo simulation of cefditoren investigating coverage by concentrations achieved in serum after 400 mg oral dosing (after meals)  according to different criteria: a) By using total concentrations and the bacteriostatic criterion (33% t > MIC), cefditoren covered strains inhibited by MICs up to 0.5 mg/l, b) By using extrapolated free drug concentrations and 33% t > MIC, coverage was achieved for strains inhibited by MICs up to 0.25 mg/l, and c) By using extrapolated free drug concentrations and the criterion of 40% t > MIC, strains exhibiting MICs up to 0.12 mg/l were covered . Evidently, the application of one or another criteria does not affect susceptibility rates of H. influenzae and S. pyogenes since even by applying the strictest PK/PD breakpoint for cefditoren (≤0.125 mg/l), susceptibility rates were almost 100% [16, 22, 41]. With respect to S. pneumoniae, Table 3 shows ranges of percentages of susceptibility against penicillin-susceptible (MIC of penicillin ≤0.06 mg/l), penicillin-intermediate and penicillin-resistant (MIC of penicillin ≥2 mg/l) pneumococcal isolates, calculated with MIC distributions from published studies [41–45] by applying CLSI breakpoints for amoxicillin and cefuroxime, and the three proposed breakpoints for cefditoren. As observed, the decrease in susceptibility to penicillin affects more the susceptibility to cefuroxime than the susceptibility to amoxicillin. For the susceptibility to cefditoren, the impact of penicillin non-susceptibility is dependent on the breakpoint value considered: high for ≤0.125 mg/l but negligible for ≤0.5 mg/l (with 95% isolates susceptible to cefditoren whether they were penicillin- susceptible, intermediate or resistant). This illustrates the importance of having breakpoints for susceptibility interpretation of microbiological data. Pharmacodynamic breakpoints can be related with bacterial eradication and subsequent therapeutic outcome . For this reason, microbiological evaluation in clinical trials provides the best quality data to support breakpoints. However, despite the percentage of resistance in the community, in a clinical trial it is difficult to have enough number of patients infected by resistant bacteria to reach conclusions. To overcome this, data from microbiological evaluation in clinical trials of community-acquired pneumonia (CAP) and acute exacerbations of chronic bronchitis (AECB) carried out with cefditoren were pooled and analyzed in order to increase the number of evaluable patients. In that analysis, 100% penicillin non-susceptible (MIC ≥0.12 mg/l) isolates of S. pneumoniae in the cefditoren 400 mg group (n = 20), 16 of 19 (84.2%) strains in the 200 mg group, and 16 of 17 (94.1%) strains in the comparator group were eradicated or presumably eradicated . Among S. pneumoniae isolates showing penicillin resistance (MIC ≥2 mg/l), 17 out of 18 (94.4%) isolates from patients in both cefditoren arms were eradicated or presumably eradicated compared with 10 out of 11 (90.9%) in the comparator group . This microbiological efficacy was accompanied by clinical efficacy, with cefditoren showing similar percentages of clinical cure than antimicrobials used as comparators. Table 4 summarizes published clinical outcomes with cefditoren in clinical trials of the different approved respiratory indications [99–109]. In pharyngotonsillitis studies, since all patients included in clinical trials had a pre-treatment positive culture, the relationship between the microbiological and clinical response obtained was investigated. The percentage of favorable clinical response was significantly higher (p < 0.01) in patients showing bacteriological eradication (≥98.5%) than in those showing bacteriological persistence (≤51.4%) , evidencing the relationship between microbiological and clinical responses. Overall, the post-treatment microbiological response (eradication) was significantly (p < 0.01) higher with cefditoren versus penicillin (used as comparator): 90.4% versus 82.7% at the end-of-treatment visit, and 84.7% versus 76.7% at the end of follow up visit, respectively . In a recent revision of eight published clinical studies, failure rates with penicillin in the treatment of pharyngotonsillitis ranged from 14 to 40%, and one of the main reasons advocated by the author was penicillin inactivation by β-lactamases present in the environment produced by β-lactamase producing bacteria , as H. influenzae. This “indirect pathogenicity” was demonstrated in a pharmacodynamic simulation using a mixed inocula of S. pyogenes, penicillin-resistant S. pneumoniae, β-lactamase positive NTHi and a BLPACR strain exposed to simulated serum concentrations of amoxicillin, amoxicillin/clavulanic acid or cefditoren . Of the three compounds, cefditoren, stable to β-lactamases was the unique compound that completely countered the indirect pathogenicity and eradicated both β-lactamase positive organisms . For the BLPACR strain the accumulation of two resistance traits (β-lactamase production and ftsI gene) represented a competitive advantage in the presence of amoxicillin/clavulanic acid , this compound not being able to completely counter indirect pathogenicity as cefditoren did. These data acquire relevance since antibiotic-treated individuals are sources for spread of β-lactamase producing bacteria to other individuals , and carriage of H. influenzae has been associated with vaccination with PCVs . Antibiotic degradation via β-lactamases enabling growth of susceptible cells in their vicinity [2, 112], even across species, has been demonstrated in other in vitro studies and in animal models, favoring S. pneumoniae growth in the presence of H. influenzae or M. catarrhalis [1, 2, 113]. In the context of biofilms, interactions between species are facilitated, and this may explain the tendency of different species to occur together , as H. influenzae and S. pneumoniae, which form a much larger biofilm together than either bacterium does on its own . This is one of the reasons for the increasing interest on biofilms in the investigational field. One of the major goals in modern clinical microbiology is the development of strategies capable of reducing biofilm infections related to chronic conditions due to the difficulty for antibiotics in eradicating bacteria within these structures (due to difficulties in reaching bacterial cells or diminished bacterial growth rate, leading to persistence). Microorganisms typically colonizing the human respiratory tract make full use of the biofilm strategy when causing non-invasive disease (chronic bronchitis, sinusitis and otitis). In chronic bronchitis, antibiotic therapy overcomes the symptoms caused by waves of planktonic cells released from the biofilm during exacerbations of the disease but fails to eradicate infection as sessile cells are inherently less affected . Due to these facts not only time to eradication of symptoms is an endpoint in clinical trials with antibiotics against exacerbations, but also time to relapse is increasingly used as endpoint. In healthy lungs, there is a transient microbiome of micro-aspirated upper airway microbial flora being cleared by normal lung defense mechanisms . Chronic exposure to cigarette smoke results in higher loads of NTHi and S. pneumoniae in lungs , and these potential pathogenic microorganisms have been detected in approximately 25% of patients with chronic obstructive pulmonary disease (COPD) during stable disease . COPD and subsequent AECBs (with related presence of released planktonic cells) are associated with biofilms [120–123], with a relevant role for H. influenzae. In addition, COPD patients with frequent exacerbations show an increase in inflammation in the upper airways contributing to the progression of the disease . Antibiotics active against planktonic cells and able to interfere or decrease biofilm development may offer clinical advantages . Additionally, the use of antibiotics may also reduce inflammatory parameters . Cefditoren showed to interfere biofilm formation in a study comparing cefditoren (0.03 mg/l) with amoxicillin/clavulanic acid (1/0.5 mg/l) that concluded that both compounds were able to reduce biofilm formation by the 10 pneumococcal isolates tested, with significant higher reductions in the case of cefditoren . With respect to inflammation, one study comparing cefditoren and levofloxacin found that the use of both antimicrobials was associated with significant reductions of IL-6 and KL-6, two mediators of lung inflammation and epithelial damage [107, 127]. The acquisition of a new strain of H. influenzae (responsible for 13–50% of AECBs [128, 129]), S. pneumoniae or M. catarrhalis has been described as a fact increasing the risk of exacerbation . With respect to S. pneumoniae, it has been reported that new episodes occurring within the first 3 months after a previous episode show a high probability of being caused by the same strain, an important feature for election of empiric therapy . Based on its in vitro activity against human-associated respiratory pathogens (Table 1) and concentrations in bronchial mucosa of 0.56–1.04 mg/kg , cefditoren provides adequate focal coverage in AECB, as demonstrated by clinical trials (Table 4). One of the clinical trials of AECB treated with cefditoren investigated the relationship between the clinical and bacteriological response, and suggested that the response to the antibiotic was more rapidly seen in signs that depend on the bacterial location (more rapid and greater decrease over time in sputum volume, and purulence and rales and rhonchi) than in those depending in part on previous structural damage . In this trial, clinical success by key baseline pathogen was 84.0% vs. 82.5% for NTHi, and 92.3% vs. 81.3% for S. pneumoniae for cefditoren vs. cefuroxime, respectively . Another mixed infection (mainly, S. pneumoniae and H. influenzae) involving biofilms is rhinosinusitis, where cefditoren has shown percentages of clinical efficacy similar to those of AECB at the end of treatment in clinical trials (Table 4). Further non-clinical studies have corroborated the adequacy of cefditoren in the treatment of LRTIs. The TOM probability model was used to predict the likelihood of clinical success in AECB considering, among other factors, the likelihood of spontaneous resolution . The study concluded that fluoroquinolones, cefditoren and high doses of amoxicillin/clavulanic acid were the antimicrobials that highest predict clinical efficacy in the treatment of AECB in contrast to cefaclor and macrolides (with predictions not much higher than that of placebo) . These results are in accordance with a 15-year longitudinal study of COPD showing that macrolides were ineffective in eradicating H. influenzae . Using the Delphi methodology to assess the consensus on the most appropriate strategy for acute LRTIs, 71% agreement was reached on the statement that empiric therapy with antibiotics characterized by a resistance profile above the 10–20% threshold and the non-protected β-lactams should be avoided . This, together with the TOM probability study  points to discard macrolides as treatment considering their lack of PK/PD activity against H. influenzae, a pathogen potentially involved. Consensus (78% agreement) was also reached on the need to use antibiotics able to target emergent BLNAR and BLPACR isolates to prevent intra-species diffusion of resistant strains when treating AECB . In vitro, cefditoren (in contrast to amoxicillin/clavulanic acid) demonstrated to counter intra-strain diffusion and spread of nonenzymatic resistance mechanisms (ftsI gene) in a pharmacodynamic simulation including several NTHi strains . Consensus (96% agreement) was also reached on the statement that among third-generation cephalosporins, cefditoren has a particularly balanced spectrum, the 400 mg dose every 12 h covering penicillin-resistant pneumococci . Apart from the use of cefditoren in the treatment of mild to moderate CAP [87, 96], cefditoren may have a role as oral treatment following intravenous treatment with third generation cephalosporins. Among others, IDSA and ATS guidelines recommend a switch to oral antibiotics for the treatment of stable hospitalized patients with CAP as soon as the patient is improving [135, 136]. A very high consensus (93%) was reached in the Delphi-based analysis on the statement that cefditoren is the best switch for intravenous third generation cephalosporins (cefotaxime, ceftriaxone) because of the similar spectrum and the highest intrinsic activity . In this sense, cefditoren has been included as recommended drug for switch therapy after intravenous treatment with third generation cephalosporins in several documents [137–139], in contrast to cefuroxime which does not provide the required high intrinsic activity and adequate pharmacodynamics . In a meta-analysis of six randomized clinical trials including 1219 patients hospitalized with moderate to severe CAP, the authors concluded that early conversion to oral antibacterial treatment appeared to be as effective as traditional intravenous treatment and was associated with fewer drug-related adverse events and shorter hospital stays , thus also reducing associated costs. In the treatment of LRTIs, the price of the antibiotic therapy does not represent the most affecting health care cost. In the Delphi-based approach, high consensus was reached on the statement that the price of the initial antibiotic therapy does not represent the most affecting health care cost (88% consensus) . Switch from parenteral to oral antibiotic therapy reduces length and costs of hospitalization, and the risk of hospital-acquired infections, improving patient’s quality of life as well (100% agreement) . On the contrary, indirect costs related to failures by resistant bacteria may have considerable influence . In this sense, in a retrospective analysis of CAP treatment, significantly higher percentages of treatment failures were obtained in metropolitan areas with ≥25% resistance than in those with lower resistance rates, with an increase in 33% of costs in the areas with resistance rates higher than 25% [141, 142]. In a cost-effective analysis carried out in three countries, first-line treatment effective against the major CAP pathogens (including strains resistant to other antimicrobials) resulted in better clinical outcomes and lower treatment costs . In addition to monetary costs, selection of resistance has a social cost derived from the impact of resistance in future infections in the community. The challenge for institutions and individual clinicians is to consider the potential impact of each antibiotic prescription on resistance . Low potential of resistance selection and ecological consideration for human microbiota are two desirable features in antibiotic treatment . Non-clinical studies carried out with cefditoren, which constitute the largest documentation in the ecological field for all antimicrobials, suggest that cefditoren possesses advantages with respect to its ability for countering diffusion and selection of resistance  in S. pneumoniae [78, 81] and H. influenzae [76, 79–82]. Theoretically, the 15 years passed since its licensure should not have harmed the intrinsic activity of cefditoren against the respiratory human-adapted pathogens but have probably improved it somewhat since, maintaining its high activity against H. influenzae (regardless the increase of BLNAR and BLPACR isolates), M. catarrhalis and S. pyogenes, the percentage of penicillin-resistant S. pneumoniae has decreased, at least in countries where PCVs have been included in vaccination calendars. Due to this, H. influenzae has acquired more relevance, and the good activity of cefditoren against this species and its ability to counter diffusion of the ftsI gene and the indirect pathogenicity by β-lactamase producing strains, strengths its value within the antibiotic armamentarium. 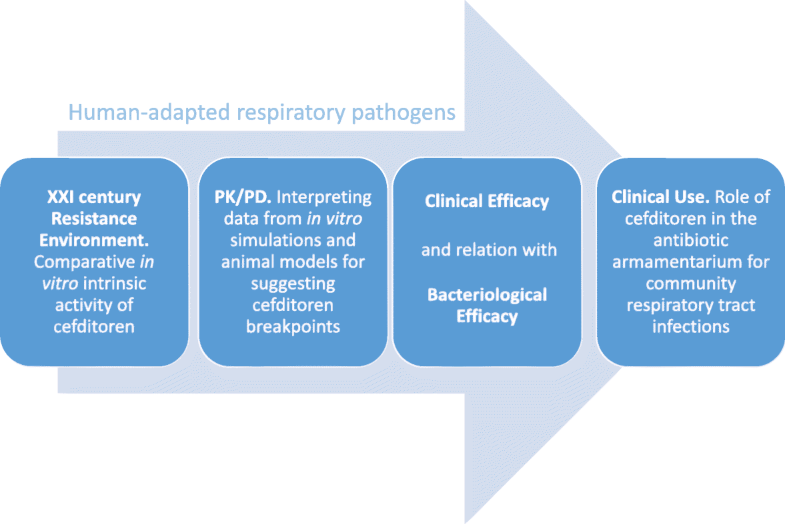 Despite there is a lack of CLSI/EUCAST susceptibility breakpoints, the first decade of the present century has provided a plethora of pharmacodynamic studies with cefditoren, focused not only on activity/efficacy prediction but also on countering selection and diffusion of resistance, which support its role in the treatment of infections caused by respiratory human-adapted pathogens, thus filling the traditional gap remaining in antibiotic development  by an active post-marketing investigational task [147, 148]. This review was performed with a grant from Tedec-Meiji Pharma S.A. (Madrid, Spain). The sponsor has had no influence on the content of the manuscript. Not applicable. All data included in the review is published and referenced. The three authors contributed in the collection of published articles with cefditoren and writing of the manuscript. All authors read and approved the final manuscript. PRISM-AG SL have received grants from Tedec-Meiji Pharma S.A. (Madrid, Spain) for the performance of pharmacodynamic studies with cefditoren. MJG and LA are members of the Research Department of PRISM-AG.